This popular Italian dish consists of chicken coated with breadcrumbs and Parmesan cheese. It is usually served with tomato sauce and pasta. This page contains recipes for Chicken Parmesan (Parmigiana). Between two sheets of wax paper, or plastic wrap, flatten each chicken piece to 1/4 inch thickness. Mix bread crumbs and Parmesan cheese. In another dish, beat egg. Dip chicken into egg and then coat with bread crumb mixture. Heat oil in 12 inch skillet over medium heat. Cook chicken in oil 10 15 minutes, turning once until no longer pink in center. Pour pasta sauce over chicken in skillet, heat until hot. Sprinkle mozzarella cheese over chicken. Mix the eggs, salt and pepper. Dip chicken in egg mixture, then in bread crumbs. Heat 1/2 cup vegetable oil in frying pan. Quickly brown chicken on both sides. Remove to shallow baking dish. Pour excess oil from pan. For the sauce: Stir in saucepan the above ingredients. Heat to boiling. Simmer 10 minutes or until thick. Stir in 1 tablespoon butter. Pour over chicken. Sprinkle 1/2 cup Parmesan cheese over this. Cover. Bake at 350 degrees F for 30 minutes. Uncover. Place 8 oz. of mozzarella cheese (sliced and cut in wedges) over chicken. Bake 10 minutes longer or until cheese melts. 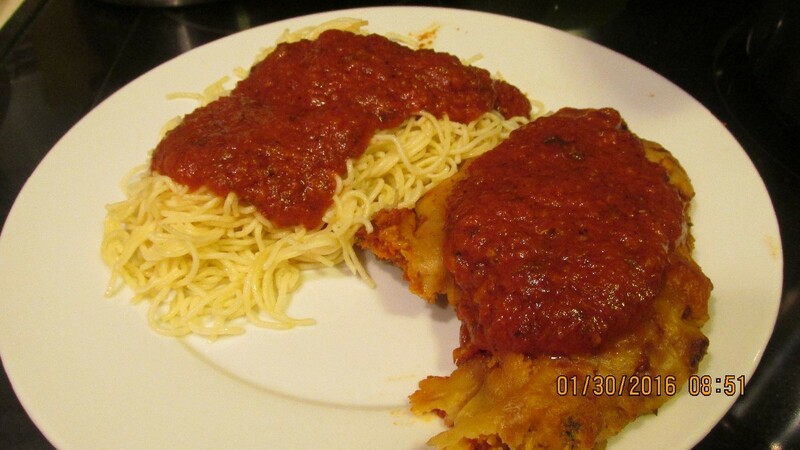 This delicious combination of chicken with parmesan breading and marinara sauce is based from the classic Italian recipe for Chicken Parmigiana. 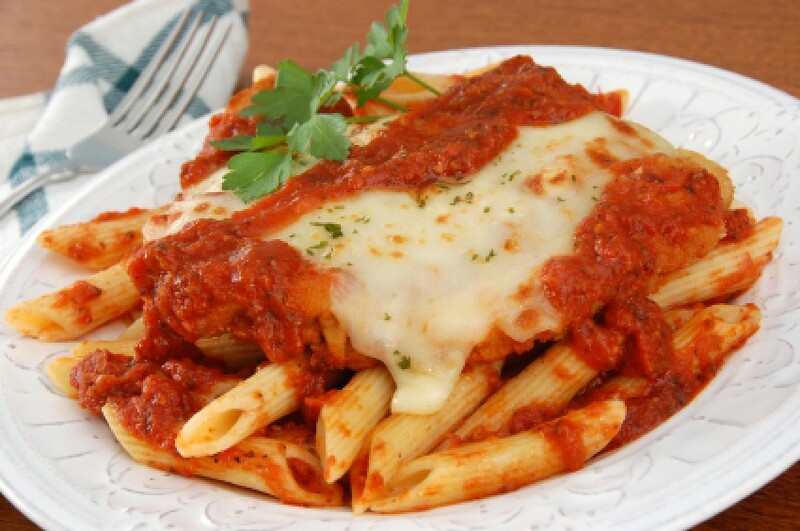 This guide contains a recipe for homemade chicken parmesan.